When the third and final unit of the 330MW Sarulla geothermal power plant went online and started operations in May 2018, it marked another milestone in Indonesia’s efforts to move towards a more renewable energy future. The $1.7b project, which will power over 2.1 million Indonesian households, is considered the world’s largest single-contract geothermal power plant in the country. This follows the commercial operations of Sarulla geothermal power plant’s first two units, the SIL and the NIL2, which went online in March and October last year, respectively. All three units of the power plant use energy converters which utilise low-pressure steam to maximise resource exploitation for maximum power output. A few hundred miles north, the Philippines is also making efforts to champion renewable energy as main components of its evolving national energy mix. In January, the country’s Department of Energy has given the green light for the construction and development of a geothermal power plant, considered a project of “national significance”, with at least 100MW capacity to power thousands of households and businesses all over the archipelago. The cases of Indonesia and the Philippines represent much of the untapped potential (and challenges) of harnessing and developing renewable energy sources, particularly geothermal, in the whole of the Asia Pacific region. The two countries have a geothermal energy capacity dilemma not because they don’t have much of it, but because they have trouble turning them into usable energy. World Bank data showed that global geothermal power generation potential is between 70 to 80GW, but only 15% of known geothermal reserves are exploited for electricity production, generating roughly just 13GW. Asia Pacific, meanwhile, represents 33.3% of the world’s total geothermal installed capacity at 27.53 GW, according to data from the World Energy Council—with a healthy margin for growth and development expected given the region’s untapped potential. Despite polarising perspectives, some private sector players believe and are banking on this huge potential for geothermal energy in Asia Pacific, for instance, Isaac Angel, CEO of Ormat Technologies, the supplier for the energy converters and designer of the geothermal combined cycle unit of the Sarulla power plant. “Ormat believes Asia is a region with significant untapped geothermal potential, and we expect to use the success at the Sarulla power plant as a stepping stone to additional opportunities,” he said. The need for cleaner and more renewable energy sources is most evident in Asia and the Pacific, considered one of the fastest growing regions in the world for decades. As these economies continue to grow, more businesses get established and/or expand operations whilst households see their purchasing power rise. This also means that national demand for power and energy would rise—something that would not be sustainably solved anymore with traditional coal and fossil fuel energy sources, given their detrimental effects to the environment including pollution and carbon emissions. This is where the push for greater utilisation of renewable energy sources come into play. Daniel Brenden, power and renewables analyst for Fitch Solutions, explained that renewable energy sources are crucial in Asia’s sustainable energy future because the technology and the costs enabling these resources are slowly decreasing over the years. However, geothermal energy’s share in the region may remain stagnant partly because of the faster growth of the other sources and the conservative view of some stakeholders on geothermal investments. Indonesia will likely be the key leader when it comes to geothermal capacity additions in the region and globally, according to the analyst. The gradual commissioning of projects in the pipeline will see Indonesia’s geothermal capacity increase to just over 3GW by 2027. Fitch Solutions noted that Indonesia’s project pipeline is expected to expand further as developers capitalise on the country’s substantial geothermal potential. But here is where the problem lies: there isn’t much to show for the region’s large potential for geothermal energy if investors, private sector players, governments, and the public remain conservative or, at times, sceptical about the gains from harnessing such renewable energy. 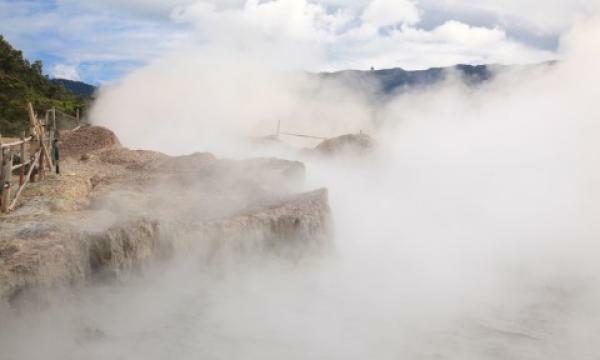 Experts insisted that the region’s geothermal potential remains very promising as shown in projects popping up in Malaysia and Taiwan, but it will take major breakthroughs to clear the path for large-scale projects in countries like Japan. Brenden highlighted Japan and the Philippines in terms of growth and challengers for geothermal energy as a power source, mentioning that whilst some growth is expected in Japan, there remain obstacles to geothermal development including opposition by onsen (hot bath) owners and environmental issues. “In the Philippines, we also believe that growth will be limited as nearly all the proven reserves have been commercialised, and because most of the unexploited and unproven reserves are located in relatively inaccessible areas, making development difficult and costly,” he explained. Geothermal energy remains largely a sleeping giant due to roadblocks affecting and coming from various stakeholders. For Michael Barrow, director general of the private sector operations department of the Asian Development Bank, an obstacle for geothermal development is that private players are more exposed to risks that may not be attractive or even feasible for any businesses. He cited Indonesia as an example, explaining that private sector investors in a project are responsible for exploring and maintaining geothermal wells and are, therefore, fully exposed to geothermal risks. This also applies to lenders like ADB, according to Barrow. “This means that, as lenders, we need to pay special attention to geothermal-specific risks on top of the usual construction/operation and maintenance risks for the power plant hardware,” he said. One of these specific risks includes figuring out whether there really is a substantial amount of geothermal resource in a specific location or not, which requires drilling test wells that will likely cost tests of millions of dollars. Other risks along the resource stream follow suit, including testing whether exploiting the geothermal resource found in a test well is worthwhile for businesses in terms of cost or not and whether these are sustainable or are able to produce enough energy to cover costs during the duration of the project. Brenden echoes this statement in terms of private sector investors and developers, saying that upfront costs of geothermal and the technical challenges of the drilling process deter renewable energy developers. For instance, initial construction costs can be between half and two-thirds of total costs, with a large component of the upfront capital being spent on exploration studies and drilling. Barrow also noted that geothermal project sites tend to be situated in remote areas often within a pristine natural habitat, giving rise to certain opposition from communities within and around potential project sites, environmental groups, and government agencies. “Safeguards due diligence, particularly biodiversity conservation, has been a key focus for all Indonesian geothermal power so far,” he said. Despite these obstacles, both Barrow and Brenden noted that the gains and potential benefits of focussing on the development of renewable energy sources like geothermal in the region can outweigh the short-term costs and risks. Barrow noted that whilst these risks are real and considerable, with geothermal never being an easy power subsector to finance, certain success stories in countries like Indonesia have proven that it can both be profitable and sustainable. “The potential of geothermal to help spur Indonesia’s economic growth in a climate-friendly manner is considerable and makes the extra effort worthwhile,” he said. In a cost perspective, Brenden explained that operational costs are minimal as there are no additional feedstock costs and geothermal resources generate a base-load, highly reliable, low carbon, and indigenous energy supply.